You have a story to tell. Maybe you didn't realize that. When you decided to follow Jesus, your story really started to develop. God has a story to tell. Since before you were bornl, God has baeen pursuing you. He sent his son for you—and your friends. Your friends have stories. Maybe their stories don't include Jesus—yet. That's where you and 3Story come in. God has a story to tell. Since before you were born, God has been pursuing you. He sent his son for youand your friends. Your friends have stories. Maybe their stories don't include Jesusyet. That's where you and 3Story come in. Evangelism is an essential element of every youth group. But when traditional evangelism methods prove awkward, ineffective, or uncomfortable for students to embrace, its almost impossible to equip your students to understand and share their faith. But 3Story® is different. 3Story is a way of life that guides followers of Christ to BE good news while telling stories of THE Good News. Based squarely on relationships, 3Story focuses Gods story, my story (the student), and their story (their friends). 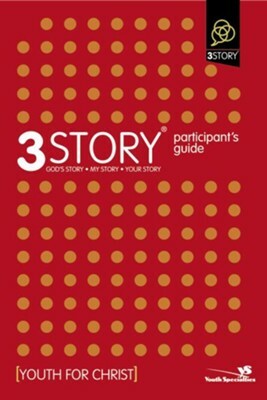 This curriculum course based on Youth for Christs 3Story training presents an interactive learning experience that equips students to live and practice the 3Story lifestylea biblically based, culturally relevant form of discipleship-evangelism that emphasizes being real in personal interactions. Dave Rahn is the vice president and chief ministry officer for Youth for Christ/USA and continues to direct the MA in youth ministry leadership (www.youthministryleadership.com) for Huntington University. A youth ministry researcher, author, and leadership strategist, Dave now guides a team whose focus is to coach, train, resource, and serve Youth for Christ men and women from all over the country who lead nearly 2,100 community-based relational outreach ministries among teenagers. He and his wife, Susie, are empty nesting and cheering on the youth ministry careers of both recently graduated children, Jason and Alison. I'm the author/artist and I want to review 3Story Participant's Guide: Preparing for a Lifestyle of Evangelism - eBook.